In 2015, Dr. Claude Bärtels (Science4Life Lab) completed a study titled “The influence of electromagnetic radiation on human tissue with special consideration of the effect of magnetic field gradients“. When using a mobile phone, there is a technical Extreme Low Frequency Electro Magnetic Field (ELF-EMF) surrounding it containing gradients. That means this electromagnetic field is diverging in its strength in different areas. Back in 1992, at the California Institute of Technology, Kirschvink discovered that those kinds of technical electromagnetic field gradients irritate the magnetite crystals inside the human brain. This sends signals to the central control unit of the brain (the pineal gland). The production of certain proteins and hormones are affected in a negative way which is called a stress response. With the modified effectiveness of melatonin, the immune system is weakened, DNA is damaged, and the body’s protein balance is affected negatively. There are less repair proteins, more stress proteins, and thus the stress level rises in the body. 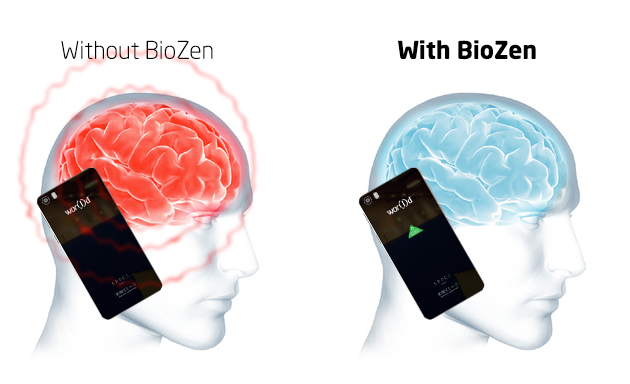 BIOZEN levels out these gradients without negatively affecting the quality of the radio frequency and simulates a flat, natural magnetic field. As a result, the brain’s magnetite crystals are not irritated anymore. The hormone and protein production returns back to normal, the DNA’s shield is built up again, and the body’s proteins start to repair the damaged DNA which helps the stress level to normalize. With its stored quantum information, BIOZEN brings order to the chaos, or rather it prevents chaos from occurring. This has a positive influence on all mobile device emissions. The legally defined specific absorption rate (SAR) only protects our bodies against the influence of high-(radio-)frequency radiation. Our bodies use low frequencies (0-30 Hz) for internal communication. The frequencies that our cell phones emit in this range continuously interfere with this communication. BioZen is the only technology in the world that expands this protection to a biological level. This is possible by positively changing the low-frequency electromagnetic fields that are formed – in contrast to the competition, which primarily aims to reduce the SAR levels. Just like the SAR value, the effect of BioZen can currently only be demonstrated under laboratory conditions. By smoothing the magnetic peaks, the usage of new mobile technologies becomes permanently easier for our bodies to tolerate. This has been proven both scientifically and medically. If you are driving a car and accelerate from 0 to 100 over a longer period of time your body won’t be under any physical stress. However, if you ride a roller coaster, which accelerates from 0 to 100 within 3 seconds, your body will feel the effects and be under physical stress.